Are you getting the best roof possible? There are different options available when you need roofing work. You can do it yourself, you can hire an independent roofer, or you can hire a roofing contractor. Now each comes with their own advantages and disadvantages you want to be aware of. Roofing isn’t easy, so before you bite off more than you can chew, find out the major differences between each. You might be surprised to learn that saving a little money now can seriously cost you later. What are the advantages of repairing my own roof? You’ll gain experience. Doing anything on your own is immensely satisfying. Roofing is no different. If you take the time to learn the craft, you’ll be better prepared the next time your roof needs attention. You’ll save money. When you perform the work yourself and buy the materials, you will save money. There are no ifs, ands, or buts, about it. Both labor and materials come with a surcharge that you won’t have to pay. What are the disadvantages of repairing my own roof? You will likely make mistakes. Experience matters, especially when it comes to your roof. A mistake now might not be noticeable until it rains. Then you’ve got flooding, water damage, and mold issues to deal with. You could get hurt. If you roof yourself, you are responsible for your actions. If you slip, get tar in your eyes, hammer your hand, or worse, you’ll be paying for the medical bills. You will not finish quickly. Because you lack experience, you won’t work quickly. Speeding up invites mistakes when you’re learning. The weather could turn before you can finish and without understanding timelines, you can easily waste dozens of hours. What are the advantages of an independent roofer? You’ll save some money. With an independent roofer, you won’t have to pay for management. You’ll likely be dealing with a much smaller crew. That equals cost reductions. You will also be responsible for purchasing materials so you can shop around. Your roofer will have experience. Unless you’ve been misled, you’ll get what you pay for. That means you don’t have to learn how to roof, and you’ll get your time back. You can also be confident in the work they do as long as you do your homework. Why shouldn’t I hire an independent roofer? You will be responsible if something goes wrong. If you hire an independent roofer, you are now a sub-contractor. If one of your new employees gets injured they have legal recourse against you if you have not bought insurance. You will need to investigate your roofer and their employees. Independents are not required to meet the rigorous standards that contracting companies are. You may trust the person you hired, but who are they bringing on the job? You risk corners being cut. 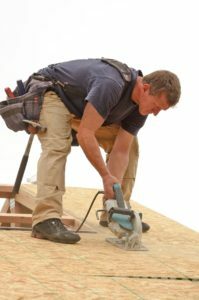 Since many independent roofers are working one job at a time and pocketing the difference, they may look to cut corners. That can mean you don’t get what you pay for. Your work may not be warrantied as well. What are the advantages of hiring a roofing contractor? They handle everything. Roofing contractors must be licensed and insured. If a worker gets injured you won’t be the one who has to pay for the injury. The company also must meet stricter rules and regulations than an independent roofer. Work is typically warranted. Individual warranties vary from company to company. These cover you in the event work was not adequately performed. This is something you won’t have if you DIY or hire a single local roofer. You know it’s done right. Looking into the reputation of your roofing contractor is easier than an independent. You can verify their abilities, speak to previous clientele, and even meet the roofers that will work on your home before work begins. What are the disadvantages of roofing contractors? You will pay more. Experience costs money. Compared to the quality of the roofing you would get otherwise, you’ll save money in the long run. The last thing you want is repair, a re-roof, or a new roof that wears-out before its time.